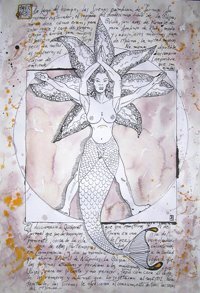 A lo largo del tiempo, las Sirenas cambian de forma. Su primer historiador, el rapsoda del duodécimo libro de la Odisea, no nos dice cómo eran; para Ovidio, son aves de plumaje rojizo y cara de virgen; para Apolonio de Rodas, de medio cuerpo arriba son mujeres y, abajo, aves marinas; para el maestro Tirso de Molina, la mitad mujeres, la mitad pez. El diccionario clásico de Lemprière entiende que son ninfas, el de Quicherat que son monstruos y el de Grimal que son demonios. Moran en una isla del poniente, cerca de la isla de Circe, pero el cadáver de una de ellas, Parténope, fue encontrado en Campania y dio su nombre a la famosa ciudad que ahora lleva el de Nápoles. La Odisea refiere que las Sirenas atraían y perdían a los navegantes y que Ulises, para oír su canto y no perecer, tapó con cera los oídos de los remeros y ordenó que lo sujetaran al mástil. Para tentarlo, las Sirenas le ofrecieron el conocimiento de todas las cosas del mundo. Along the time, the Sirens change form. His first historian, the rapsoda of the twelfth book of the Odyssey, doesn't tell us how they were; for Ovidio, they are birds of reddish plumage and virgin's face; for Apolonio of Rodas, of half body up are women and, below, marine birds; for the teacher Tirso of Molina, the half women, the half fish. The classic dictionary of Lemprière understands that they are nymphs, that of Quicherat that you/they are monsters and that of Grimal that you/they are demons. They live in an island of the west, near the island of Circe, but the cadaver of one of them, Parténope, it was found in Campania and he/she gave their name to the famous city that now takes that of Naples. The Odyssey refers that the Sirens attracted and they lost the navigators and that Ulises, to hear its song and not to perish, covered with wax the hearings of the rowers and it ordered them to hold it to the mast. To tempt it, the Sirens offered him the knowledge of all the things of the world.